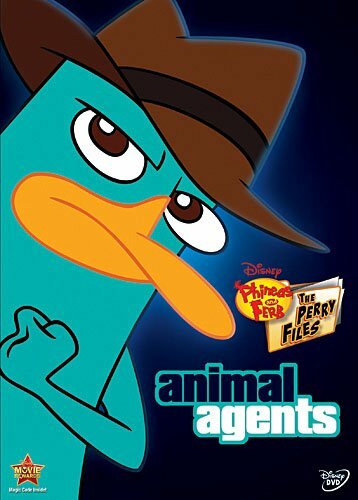 Phineas and Ferb: The Perry Files - Animal Agents is a single disc release containing twelve Phineus & Ferb episodes (that's half episodes which are like 15 minutes long, not twelve 30-minute episodes) that are spread across the first three seasons of the show. These episodes tend to focus on animals, which kinda makes sense given the title "Animal Agents". As far as I know, there are no full season box sets, so if you want to watch Phineas & Ferb on DVD this is the way you've gotta do it. Not that it's a terrible thing, I mean the show is fantastic, funny and entertaining for both kids and adults. I just think it would be nice if we could get entire season instead of a mix of episodes. So this disc contains the following twelve episodes, plus a bonus featurette called "Take Two with Phineas & Ferb" where Phineas and Ferb interview various celebrities, kinda like that old Space Ghost Coast to Coast show. If you haven't seen the show, each 15 minute episode (well, more like 12 minutes when there are no commercials) has two basic stories, one with Phineas and Ferb build some kind of amazing device while their sister tries to get their mom to see what their doing, and the other with their pet platypus Perry sneaking off to fulfil his secret agent duties of stopping the evil Dr. Doofensmirtz's scheme. The two usually intersect at the end causing whatever Phineas and Ferb built to completely vanish right before their mom looks in their direction. It's a fun show with a positive outlook and no real bad guys to speak of. Sure, Dr. Doofensmirtz is supposedly evil, but he's not very good at it, coming up with ridiculous schemes which seemed doomed to fail regardless of wether Perry intervenes. It's a good DVD that'll definitely entertain.